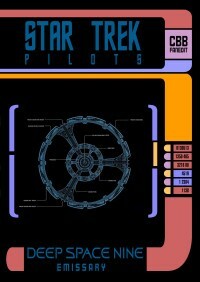 As part 2 of the Star Trek pilots project, this was far more difficult to handle than TNG. The quality of the original DVD source (and bluray, which contains the very same video and audio quality) is atrocious, an insult for a fan. The image is blurry, fuzzy and comes with a lot of tiny errors that spoil the Trekkie fun. Yet it is probably the best of all the pilots plot-wise. It took me a while to motivate myself to really present this in widescreen as it makes the quality problems even more obvious, yet I realized that I could get used to it and still enjoy it for what it is. The decision to remove the “encounter with the prophets” was a tough one, but after having watched Emissary about 5 times now these scenes became more and more annoying. Taking them out leaves a plot-hole, which I kind of fixed by adding a complete mix of the scene as an addon. But how the episode plays without this weird encounter is very interesting, as the entire atmosphere is a lot darker and more space war focused. This is still not a huge fanedit, but a labor love and I thought a few of you might be interested in watching. The result is not (probably cannot be) perfect (see additional comments below, where I mention the issues), but I think it’s an entertaining fun watch from the good old early 90s, when one of the most interesting and underrated shows ever started. Personally I prefer DS9 with the final episode of season 3 launching into season 4. The dominion war is one of the greatest ever space adventures IMO. Still Emissary does have a nostalgic value to me and was fun to spend time with again. This release is not (and maybe cannot be) perfect. Here are the known issues: To turn 1.33:1 to 1.78:1 meant to sacrifice more than 20% of the visible image from top and bottom. This results in: big faces, some blurry images. Because of the overall rather bad image quality of the DVD source there is also in some scenes: blurriness, a bit of stuttering, quite some visible noise pixelation, some very tiny interlacing issues, which I could not properly repair. The original comes with a lot of video imperfections and I was not able to correct them all. The deinterlacing filters did cause some stutter and flicker in a few scenes. What you should also know: As for almost all shows of the 80s and 90s this one was shot, edited and effect-worked with on video, not film. There is no high quality master, so you will probably NEVER really get a widescreen version or even a HD version of this. This fanedit will give you a glimpse of what DS9 would have looked like as a modern show. This is a widescreen version of EMISSARY, the pilot double episode of Star Trek – Deep Space Nine. The most striking annoyances have been removed for a much darker space war atmosphere. 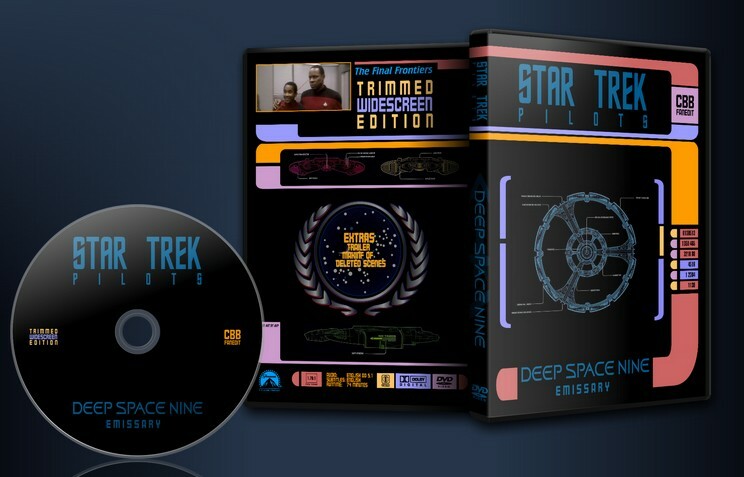 Deep Space Nine was unlike The Next Generation from the very start a less episodic TV show and had a more continuing and developing plot. It had an entirely different atmosphere, touched a lot of darker subjects and was overall the far more interesting show, taking place in the Star Trek universe, but with very few similarities to the OS and TNG. The menus are just completely excellent. Some great use of the menu structure to mimic the LCARS interface. Very, very nice. So basically so far everything is either good, great, or flawed due to no fault of the editor. But I do have to give thumbs down to the removal of Ben Sisko’s experience with The Prophets. I feel it negatively affects the episode on two levels. The other reason is that now Sisko’s emotional arc does not exist. There is no exploration as to why Sisko changes his mind and decides to stay on DS9.